It is rumored that some 200 million bank accounts were linked to WeChat over the 2015 Lunar New Year holidays (China’s most popular online payment service Alipay has over 300 million users). Though WeChat deny disclosing it, it’s believed a considerable number of users did so to send or receive lucky money. All the participants in the 2015 Lunar New Year lucky money war -Tencent’s WeChat, Alibaba’s Alipay and Weibo (in which Alibaba has a stake, with its payment service supported by Alipay) – have released some impressive numbers. Alipay had had more than 100 million participants in the four days after New Year’s Eve. This was the second time Weibo tried digital lucky campaign during the Lunar New Year holiday, with the company seeing a 46% increase in active participants, reaching 102 million people on New Years Eve. WeChat’s numbers are even more impressive than its two rivals, largely because its campaign launched on the Spring Festival Gala, the enormously popular New Year’s Eve show by state broadcaster CCTV. Lucky users of WeChat’s Shake feature at certain times during the show received digital Red Envelopes with randomly allocated money or e-coupons. WeChat users in 185 countries shook a total of 11 billion times, with 810 million at peak time, during the show. RMB500 million (roughly US$83m) worth of lucky money and e-coupons, from participating businesses such as JD.com, Huawei and Haier, were distributed that night. This is important for WeChat not just as a one-off campaign but because of the number of bank accounts connected and the likelihood that the received lucky money would be used to purchase goods or services through WeChat. 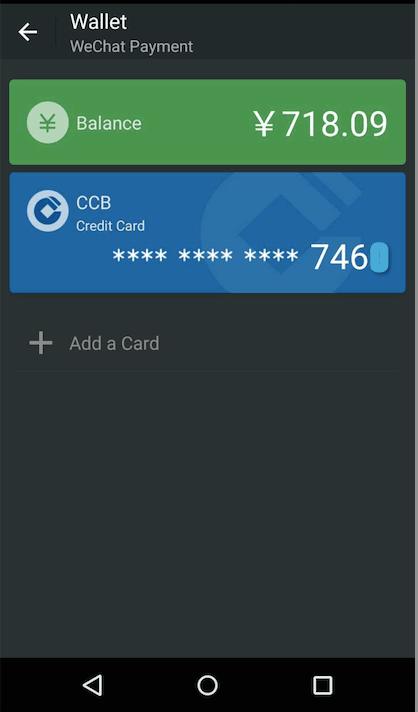 WeChat requires connecting at least one credit or debit bank card if a user wants to cash out the remaining balance on their WeChat Payment Wallet or receive a Red Envelope with lucky money larger than an amount. Whether letting the money sit in the Wallet or bundling a bank account, both will boost usage of WeChat Payment, the mobile payment application developed on top of Tencent’s online payment service Tenpay. Besides supporting mobile payment for third parties, what WeChat wants is have more businesses set up storefronts on its platform. Through its Public Account (or Official Account) system, businesses are able to distribute promotional content and e-coupons or even sell goods to their subscribers. Payments, of course, are supported by WeChat Payment. Now there are as many categories of businesses on WeChat as on Alibaba’s marketplaces. But WeChat Payment has far fewer users than ten-year old Alipay, which operates under Alibaba’s finance arm Ant Financial. The Chinese New Year campaign has been an efficient tool to acquire users for WeChat’s payment service. Alibaba has long ago known that WeChat would challenge its dominance in online payment and retail marketplaces, which is why it revamped its lucky money feature before the New Year holiday. But whether or not WeChat has become a real threat to Alibaba’s core businesses, the Chinese custom of giving lucky money has fundamentally changed by WeChat and will be dominated by it for a long time.